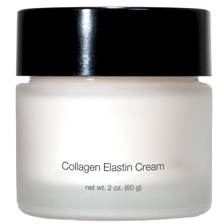 COLLAGEN ELASTIN CREME - 2 oz.- Rich, emollient, hydrates & plumps - TOP SELLER! Home > Skin Care > Shop by Skin Type > Dry or Mature > COLLAGEN ELASTIN CREME - 2 oz.- Rich, emollient, hydrates & plumps - TOP SELLER! Rich, emollient creme helps plump and firm skin. Smoothes, soothes and helps improve moisture retention. Potent antioxidants protect against future damage from environmental aggressors.